COSCO SHIPPING Ports Limited, the world's leading ports operator, yesterday announced full year results of the Company and its subsidiaries (the “Group”) for the year ended 31 December 2018. During the year, throughput of the Group's subsidiaries, becoming one driver of the business, increased by 29.7% to 22,507,686 TEU (2017: 17,353,422 TEU), made up 19.2% of the Group's total. Throughput of QPI has been included since May 2017; excluding QPI, total throughput increased by 11.5% to 98,045,360 TEU on a comparable basis. Throughput of the non-controlling terminals rose by 14.5% to 94,857,674 TEU (2017: 82,848,763 TEU). During the year, synergies with Ocean Alliance and parent company were further strengthened; volume contributed by the OCEAN Alliance accounted for about 49.9% of total throughput of six major subsidiaries for the year, representing an increase of 33.7% compared with 2017. In 2018, throughput of the Greater China region increased by 13.8% to 92,597,126 TEU (2017: 81,361,521 TEU) for the year and made up 78.9% of the Group's total. The Bohai Rim region delivered strong growth, throughput soared by 35.7% to 38,328,815 TEU compared with last year's 28,244,975 TEU; mainly because QPI has a year-full contribution in 2018 while last year only had 8-month. Throughput of the Yangtze River Delta region made up 16.9% of the Group's total and increased by 0.9% to 19,808,646 TEU (2017: 19,630,693 TEU) for the year. Nantong Tonghai Terminal was inaugurated on 30 June 2018. 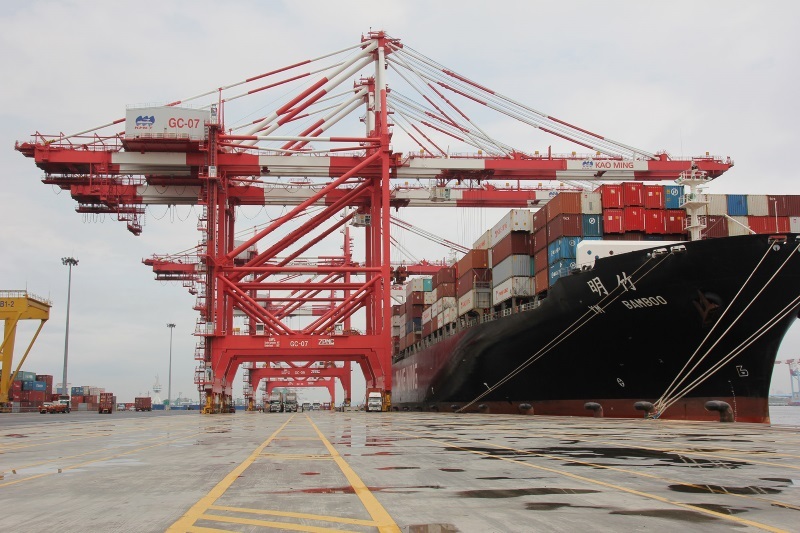 With three container berths and one bulk berth, Nantong Tonghai Terminal delivered 264,255 TEU container throughput in its trial operation during the year. Throughput of the Southeast Coast region increased by 12.2% to 5,699,718 TEU (2017: 5,079,660 TEU). Xiamen Ocean Gate Terminal increased throughput by 31.2% to 1,968,613 TEU (2017: 1,501,001 TEU) for the year, mainly due to increased calls by the OCEAN Alliance. Performance of the Pearl River Delta region was rather weak compared with other regions in China, throughput of the region increased marginally by 1.3% to 27,388,896 TEU (2017: 27,049,188 TEU). Throughput of Yantian Terminal increased by 3.6% to 13,159,705 TEU compared with last year's 12,703,733 TEU, while Hong Kong decreased by 6.6% compared with 2017, mainly due to competition from neighboring area. Operation scale of the Group in Southwest Coast remained small in the year, throughput of the region increased slightly by 1.0% to 1,371,051 TEU (2017: 1,357,005 TEU). Planned to enhance presence in the region, COSCO SHIPPING Ports took 4.34% stake in Beibu Gulf Port Co., Ltd. by subscribing shares in the company in December 2018. Performance of overseas terminals posed a strong growth in the year. With contributions from newly acquired terminals including the CSP Spain Group and CSP Zeebrugge Terminal and the supports from shipping alliances and parent company, throughput of the overseas portfolio increased by 31.5% to 24,768,234 TEU (2017: 18,840,664 TEU) for the year. The CSP Spain Group delivered throughput of 3,622,200 TEU and throughput of CSP Zeebrugge Terminal increased by 24.0% to 392,484 TEU compared with 316,448 TEU in 2017. Backed by the continuous support from the OCEAN Alliance and other shipping alliances, Piraeus Terminal achieved 19.4% growth in volume to 4,409,205 TEU (2017: 3,691,815 TEU) for the year. Added a new berth of one million TEU in January 2018, throughput of COSCO-PSA Terminal surged 56.5% to 3,198,874 TEU (2017: 2,044,536 TEU). In view of the strong demand in South East Asia and align with the Company's strategy of strengthening presence in South East Asia, COSCO-PSA Terminal announced the launch of two new berths with about 2 million TEU in total in January 2019; with the launch of the two new berths, COSCO-PSA Terminal is equipped with five container berths, increasing its annual handling capacity from 3 million TEU of the current three berths to about 5 million TEU. Abu Dhabi Terminal, the first overseas green-field subsidiary of the Company, will begin trial operations in April 2019 with 1.5 million TEU handling capacity to start with and will gradually ramping up the volume until the official operations scheduled to commence in the third quarter of 2019. It is expected that macroeconomic and geopolitical uncertainties will continue in 2019 and likely to create headwinds in some regions in the year; COSCO SHIPPING Ports while stays committed to building well-balanced terminal network globally, will remain financially disciplined, and initiatives have been taken to optimize cost structure of the Group to maximize returns.